When a single cask expression of Sullivan’s Cove French Oak (barrel no. HH0525) won the award for world’s best single malt at the World Whiskies Awards 2014 it was a wonderful time for Australian whisky. The atmosphere was electric, charged by the realisation that Australian whisky had come of age. It did not take long for the Sullivan’s Cove French oak to disappear from bottle shop shelves, and for bottles of them to appear on online auction websites – one bottle of HH0525 even sold for $1,150 through Lawsons. People who had Sullivan’s Cove French Oak from other barrels also tried their luck, doing their darndest to pass off whatever barrel number they happened to have as “the world’s best” or tasting the same as the “world’s best”. Now, even Sullivan’s Cove seems to be getting in on the action as they try to pass off ALL their whisky as the world’s best. It needs to be remembered that a single cask expression of Sullivan’s Cove’s French Oak recently won world’s best single malt at the World Whisky Awards – barrel no. HH0525. The truth is that whisky does vary between casks, because the wood making up each cask is different and even the distillation runs, fermentations and micro climate within a distillery may fluctuate. Just look at Jim Murray’s varied scoring of Sullivan’s Cove from different casks. This means that the Sullivan’s Cove whisky that won the world’s best single malt at the World Whiskies Awards is from ONE CASK, and it is likely to be different to whisky drawn from other casks. 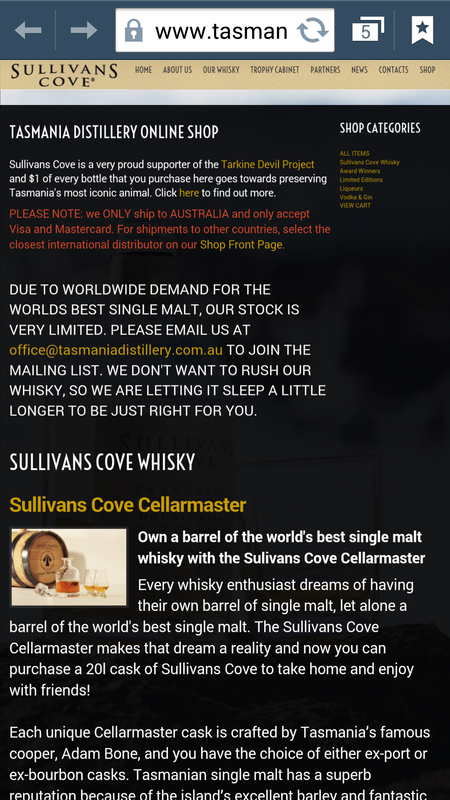 Unless the Sullivan’s Cove whisky is from the same cask as the whisky that won the award, it appears to me that the Sullivan’s Cove marketing spin (captured, left of screen) is designed to mislead and deceive consumers in my opinion – it looks like shameless profiteering, telling half truths to make a product more desirable. In the screenshot left of screen, on my reading Sullivan’s Cove even try to pass off their ex-bourbon matured whisky as the world’s best, when in fact it was the French Oak that won the award. This is the ugly side of Australian whisky. I can see how a consumer would be misled by the representations made, because it seems that people unaware of the way different casks produce different whisky might just think they’re buying “the world’s best whisky”. Buying this product, the sales pitch goes, can make the dream of owning the world’s best whisky a reality but what is not mentioned is that the whisky that won the World Whiskies Award was from just one barrel and that the dream – unless you find HH0525 – won’t ever be a reality. It begs the question: why did Sullivan’s Cove even bother mentioning that consumers can own a barrel of the world’s best whisky if the whisky that won the title is most likely all sold out? I think you can figure that one out for yourself. It seems that shameless profiteering in response to the World Whiskies Awards may have cast a dark cloud over Australian whisky. I hope that dark cloud clears very soon, and there weren’t too many people who handed over their hard earned cash for the “world’s best whisky”. So, what do you think? Would you have been misled by Sullivan’s Cove? This entry was posted in Uncategorized and tagged Australia, Sullivan’s Cove. Bookmark the permalink. Great article. That is so misleading by Sullivan’s Cove, I agree. Really well written article. You raise some important points about buying premium whisky and I agree with a lot of it – though I don’t think I would be so harsh in my criticism. Do Sullivans Cove use their accolade as a selling point? Yes, undoubtedly. Could people buy a bottle of bourbon finish mistakenly thinking it’s the world’s best? Yes, in all likelihood. Are Sullivans Cove deliberately misleading customers? I personally think that’s a step too far and will support the distillery as they themselves are so supportive of the Tasmanian whisky scene. Perhaps their advertising would be clearer if it stated: “due to being makers of the world’s best single malt, our stocks are very limited”. Anyway, great article, and I certainly don’t mean any disrespect by my response. As I was auctioning a bottle off, a staff got chatting, he tried two batches and said the flavour were much the same, difference being one was slightly lighter in flavour, his opinon was that it’s a good whisky though, over hyped. Being descibed as a caramel tunnock by a reviewer, I bought a taster bottle and looking forward to it knowing that batch won wwa best australian single malt. I’m looking forward to it, maybe it’ll convince me to open a bottle. Have you tried different batches? If so, what’s your thought on the taste? Thanks for taking the time to write. I have tried different batches of the Sullivan’s Cove French Oak, American Oak and Double Cask. They are all “similar”, in that they offer the Sullivan’s Cove distillery character and each cask type gives the whisky some consistent character that is associated with that cask type (ie: vanilla from Americak oak, the caramels from the French Oak etc). Beyond those basics, the favour profiles from each batch do vary – they might have a different balance of flavours, or maybe the oak had something extra to give a particular batch etc. You can read my tasting notes in the Australian whisky section of Malt Mileage.